Ever since I can remember, I have always had a great passion for cooking. I made the decision to take my passion for cooking to the next step by becoming a personal chef. I launched TheChefWorks in 2005 after completing my culinary training with the United States Personal Chef Association. I am living the dream everyday by preparing healthy and wholesome meals for my client families. Our business has grown leaps and bounds every year since its' inception which to this day continues to be enormously gratifying. In 2009 I became a personal chef and a partner in TheChefWorks. Like Chef Joe I have always had a great infinity for cooking (and baking) ever since I was able to reach a countertop. My personal goal in joining the company was to provide healthy alternatives to take-out and fast-food for busy families on the go. I have extensive experience in low-calorie, low-sodium, low-sugar, gluten-free meals. The success of our business is a daily reward for me and I am grateful for the opportunity to provide a healthier eating lifestyle for my client families. 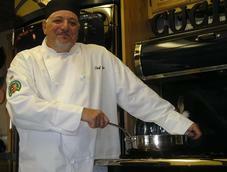 The Chef Works was established in 2005 by Chef Joe Rizzi. Our mission is to provide wholesome meals for folks with hectic lives interested in achieving a more balanced and healthier eating lifestyle. We soon discovered not only did our service offer our clients an improved eating lifestyle, it also provided the "gift of time" back into their lives. We take much pride in the preparation of our meals using only the best of ingredients, always fresh and always wholesome. With TheChefWorks you get your meals custom made to order with a large variety of choices from hundreds of proven recipes. TheChefWorks is family-owned and operated right here in San Jose, CA. Other companies may offer similar services, but our services are a step above and with a personal touch and professional pride.